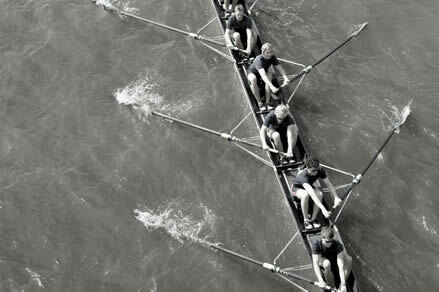 The Club is registered with British Rowing under the name “1884 BC”, named after the year the Old King’s Club was founded. This replaces the earlier name of “Cabbages BC”. In addition to partaking in regattas around the UK, 1884 BC puts together an VIII to race the School’s current 1st VIII in December. This offers the opportunity for past competitors to catch up with each other and see the prospects for the School in the coming season. The Club has an arrangement with the School that at weekends groups can come down and take out some of the shells. The winter months are a time of the year when most crews are grinding out the miles on the ergo and establishing a strong base of strength and conditioning on which to build for the summer. Whilst that may be the case for the current KCS 1st 8+, who recently excelled against the best junior crews in the world at the Head of the Charles Regatta in Boston, the 1884 Boat Club are not ‘most crews’. At KCSBC’s 2017 Festive Races, the Old King’s Club (1884 BC) crew took to the water in the aptly named “King’s Gift” with one thing in mind: setting the record straight after the controversial dead heat verdict of last year’s race. The conditions: an overcast tideway afternoon with just a hint of a tailwind breathing down the course. Perfect conditions then, for stroke man Charlie Buchanan to lead the boys out onto a punchy rate 42 rhythm, which he did with characteristic elan. 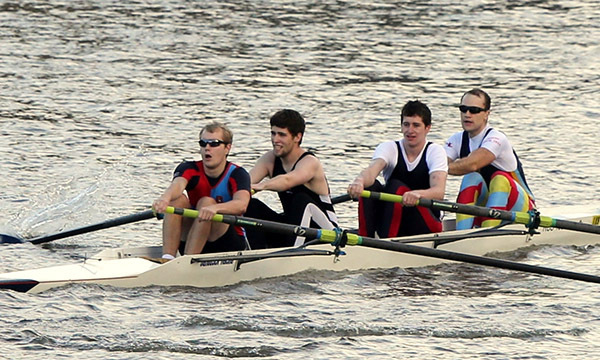 This was reinforced by some familiar faces in the bow 7 of the boat. Once again, however, the old boys fell victim to underhand tactics from the youngsters, conceding a half length lead before the race had even begun. Cox Hugo Forshaw showed great composure, as his crew overhauled the deficit in the first three quarters of the race and in the final dash to the line it was all to play for. The big effort from 1884 was starting to show and the school boys began inching back. The official verdict: too close to call in yet another race that will be remembered as much for the controversy surrounding it as the rowing. 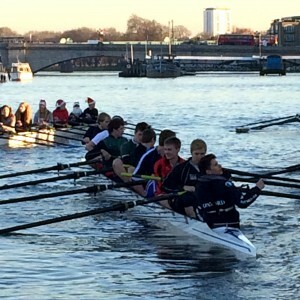 The annual Old King’s Club (1884 BC) vs School (KCSBC) race took place as part of KCSBC’s Festive Races. 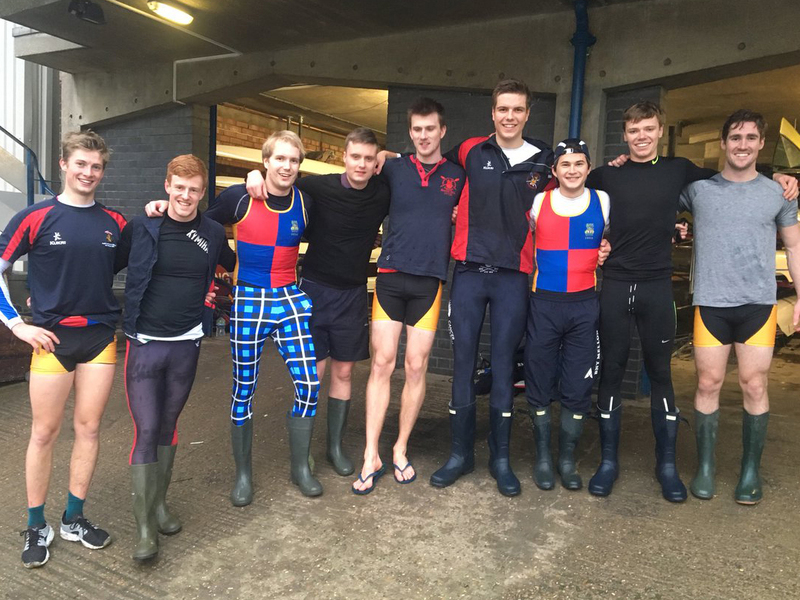 A mixed line up was assembled to take on the school 1st VIII including drilled athletes from top university rowing squads and recent leavers who have perhaps been enjoying their gap years a little too much. Despite minimal preparation time, the 1884 crew started fast and hard, moving steadily out to a third of a length lead in the first half of the race. The schoolboys’ superior fitness kicked in and they soon stopped the rot. Fortunately, the finish line came quickly in the short sprint race and 1884 ran out strong 1/3 of a length winners for the first time in 4 years. 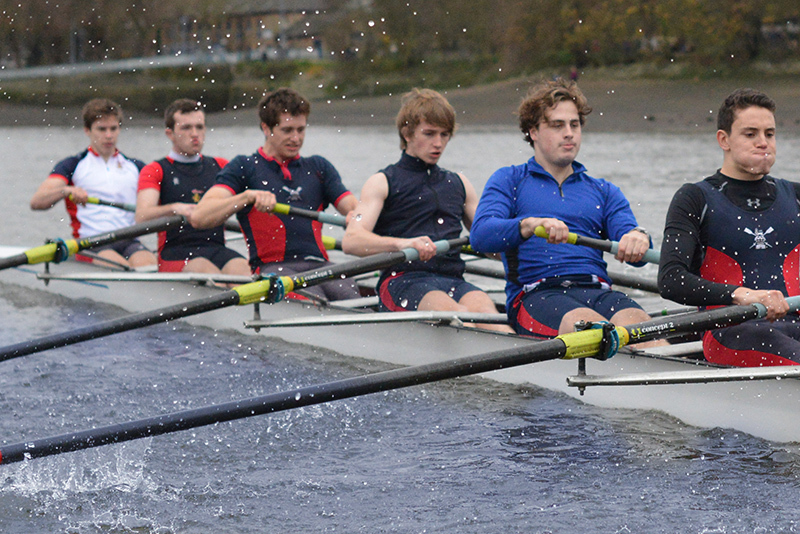 On 6th December KCSBC held it’s annual Festive Races and a race against 1884 BC. A high quality OK crew containing 4 GB vests, multiple national medals and members of some of the top student rowing squads in the country was assembled. The School 1st VIII responded by parachuting in their own big guns, in the form of their coaches, including an Olympian and a Henley winner. With no time together before the race, the 1884 crew was sluggish out of the blocks, but soon hit their stride and were coming back fast when the finish line came too soon on the short 300m course. The final verdict: 1 foot to the schoolboys/coaches. 1884 BC made its debut at the Fuller’s Head of the River Four’s on 1st November 2014. Only having the warm up time to gel as a crew, the results were nothing to write home about, but the crew took pride from the fact that we were the only school alumni club able to put a boat together at a time of year when all students are at university. 1884 had taken to the water for the first time and it is sure to be the start of something more.